Rice, oatmeal, or barley? What infant cereal or other food will be on the menu for your baby's first solid meal? Have you set a date? Here is information from the American Academy of Pediatrics (AAP) to help you prepare for your baby's transition to solid foods. Here are some helpful tips from AAP Pediatrician David Hill, MD, FAAP on starting your baby on solid foods. Remember that each child's readiness depends on his own rate of development. Can he move food from a spoon into his throat? If you offer a spoon of rice cereal, he pushes it out of his mouth, and it dribbles onto his chin, he may not have the ability to move it to the back of his mouth to swallow it. That's normal. Remember, he's never had anything thicker than breast milk or formula before, and this may take some getting used to. Try diluting it the first few times; then, gradually thicken the texture. You may also want to wait a week or two and try again. NOTE: The AAP recommends breastfeeding as the sole source of nutrition for your baby for about 6 months. When you add solid foods to your baby's diet, continue breastfeeding until at least 12 months. You can continue to breastfeed after 12 months if you and your baby desire. Check with your child's doctor about the recommendations for vitamin D and iron supplements during the first year. Start with half a spoonful or less and talk to your baby through the process ("Mmm, see how good this is?"). Your baby may not know what to do at first. She may look confused, wrinkle her nose, roll the food around inside her mouth, or reject it altogether. Do not be surprised if most of the first few solid-food feedings wind up on your baby's face, hands, and bib. Increase the amount of food gradually, with just a teaspoonful or two to start. This allows your baby time to learn how to swallow solids. NOTE: Do not put baby cereal in a bottle because your baby could choke. It may also increase the amount of food your baby eats and can cause your baby to gain too much weight. However, cereal in a bottle may be recommended if your baby has reflux. Check with your child's doctor. 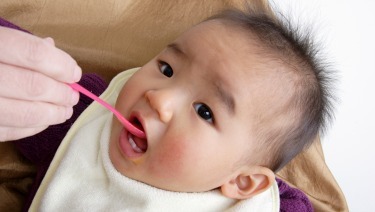 For most babies, it does not matter what the first solid foods are. By tradition, single-grain cereals are usually introduced first. However, there is no medical evidence that introducing solid foods in any particular order has an advantage for your baby. Although many pediatricians will recommend starting vegetables before fruits, there is no evidence that your baby will develop a dislike for vegetables if fruit is given first. Babies are born with a preference for sweets, and the order of introducing foods does not change this. If your baby has been mostly breastfeeding, he may benefit from baby food made with meat, which contains more easily absorbed sources of iron and zinc that are needed by 4 to 6 months of age. Check with your child's doctor. There is no evidence that waiting to introduce baby-safe (soft), allergy-causing foods, such as eggs, dairy, soy, peanuts, or fish, beyond 4 to 6 months of age prevents food allergy. If you believe your baby has an allergic reaction to a food, such as diarrhea, rash, or vomiting, talk with your child's doctor about the best choices for the diet. Within a few months of starting solid foods, your baby's daily diet should include a variety of foods, such as breast milk, formula, or both; meats; cereal; vegetables; fruits; eggs; and fish. At each of your baby's daily meals, she should be eating about 4 ounces, or the amount in one small jar of strained baby food. Limit giving your baby processed foods that are made for adults and older children. These foods often contain more salt and other preservatives. NOTE: Do not give your baby any food that requires chewing at this age. Do not give your baby any food that can be a choking hazard, including hot dogs (including meat sticks, or baby food "hot dogs"); nuts and seeds; chunks of meat or cheese; whole grapes; popcorn; chunks of peanut butter; raw vegetables; fruit chunks, such as apple chunks; and hard, gooey, or sticky candy. When your baby starts eating solid foods, his stools will become more solid and variable in color. Because of the added sugars and fats, they will have a much stronger odor too. Peas and other green vegetables may turn the stool a deep-green color; beets may make it red. (Beets sometimes make urine red as well.) If your baby's meals are not strained, his stools may contain undigested pieces of food, especially hulls of peas or corn, and the skin of tomatoes or other vegetables. All of this is normal. Your baby's digestive system is still immature and needs time before it can fully process these new foods. If the stools are extremely loose, watery, or full of mucus, however, it may mean the digestive tract is irritated. In this case, reduce the amount of solids and introduce them more slowly. If the stools continue to be loose, watery, or full of mucus, consult your child's doctor to find the reason. Healthy babies do not need extra water. Breast milk, formula, or both provide all the fluids they need. However, with the introduction of solid foods, water can be added to your baby's diet. Also, a small amount of water may be needed in very hot weather. If you live in an area where the water is fluoridated, drinking water will also help prevent future tooth decay. If you have any questions about your child's nutrition, including concerns about your child eating too much or too little, talk with your child's doctor. Ask the Pediatrician: When can I start giving my baby peanut butter?